A resident of Ramat Bet Shemesh called me to say that a strange bird had entered their apartment and was unable to fly. They had been informed that I was the go-to person about such an event. When they told me that it had a curved beak, I promised to come right away. It's a female kestrel, the most common type of falcon in Israel. It seems to have a broken wing, so I'm going to take her to the veterinary clinic at the Jerusalem Zoo. The Head of Animal Management at the Nature Authority told me that if it makes a full recovery, it will be released, but otherwise, I will be able to keep it. Today, it happily ate a hamster. 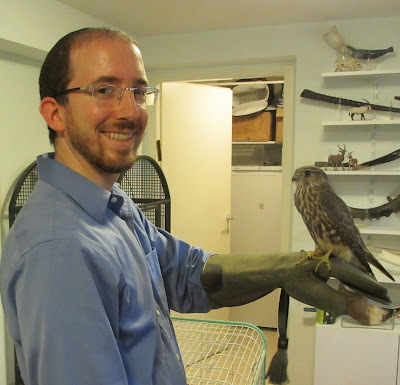 Soon, I will be publishing an article about medieval Jewish falconry. Gosh, that's gotta be hard on your kids: "Quick! Hide the hamster! Tati's home and you know what that means!" Widening your gyre a bit, I see. Nice! Is it possible to visit your bestiary? Perhaps I cant judge it objectively, but I kind of think that you could tell what is going on in the picture of the bird and the hamster even if you could only see the eyes. Rabbi Slifkin: I am disappointed, though, I suppose, not surprised, that you are not familiar with that very famous-- and justifiably so-- poem of Yeats. Of particular relevance to the "Slifkin affair" are the oft quoted lines "The best lack all conviction, while the worst/are filled with passionate intensity." Thank God you did not "lack conviction," but, alas, some of your fair-weather supporters did. We're all waiting with bated breath to see how it turns out. Is the bird sitting on a sefer? I live in Israel. Newspapers have Hebrew writing. I'll bet the hamster wasn't too happy. I thought "gyre" was also mentioned in Lewis Caroll's Through the Looking Glass. Glad you saved the kestrel! Are they in danger of being "endangered" in Israel? Yes, the hamster is part of the "circle of life" but perhaps it's disconcerting to some viewers to actually SEE the kestrel squeezing the life out of the little guy while he stares at the camera pleadingly. Voyeuristic? It wasn't clear from the picture - what's the most appropriate hebrew newspaper to use for lining animal cages? Hamodia, Yated, that local BS rag? M Singer: Indeed, at the beginning of the famous poem Jabberwocky. I really wish you had printed some kind of warning before showing the photo of the kestrel and the hamster. Do kestrels swallow their prey whole? What else does an Israeli Kestrel feed on? From the Organization for the Preservation of Newspaper Wildlife: No pictures of Rabbi Ovadia Yosef were harmed in the making of this blogpost. Why a bird needs to kill a hamster? Could it eat worms or tuna fish from a can? I fell bad for the hamster. This is cruel. Yeats sounds better, but I'm hungry. Worms are also animals, and I imagine they don't particularly enjoy being killed by a bird. And "tuna fish" from a can was once a living fish, which was also killed, and very likely suffered at least as much as the hamster (although we didn't see it). Would it be less cruel if they sold canned hamsters? This is different. Hamster is a pet that you take care of. It probably even had a name. Now you just feed it to the dogs, I mean birds? I think the kids didn't like it either. Were not they upset? Oh, isn't there a Chazal that says that a shochet is shutafo shel Amolek? Meaning to say that it is cruel even when necessary? "It probably even had a name"? 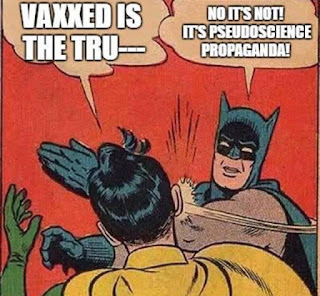 What is the basis for that assertion? It had no name and it was not a pet. And it had a better life, and death, than the chicken you ate on Shabbos. Unless you are a vegetarian? Yes, there is a very slight degree of cruelty in taking the life of any animal. Fortunately, I did not take the life of this hamster. Furthermore, there is also cruelty in letting kestrels starve to death. A couple of months ago, I was walking home from synagogue with my kids 7 and 5. We stopped to watch a mother duck leading her brood of fuzzy little ducklings. Suddenly, a kestrel stooped down grabbed one of the ducklings and flew away with the fuzz ball in its landing gear. My son the five year old was horrified. But it was pretty neat to see nature documentary stuff happening thirty feet away. I said 'probably' because I assumed it was a pet hamster and kids usually give them names. I actually eat everything including zebu, buffalo and bison. But I guess that if I had to schect them personally I would be a vegetarian. So did you buy the hamster specially to feed it to that creepy bird? It's Halloween here and the bird looks satanic! I agree that hamster had a better life but not a better death than my chicken. Schita is more humane than being ripped apart by a satanic looking bird. Remember: a bird in hand means birdpoo on the fingers. Mit a blue shirt - showing your true colors. And here's a tasteless suggestion that popped into my head: using hamsters for kapporos. A 'geshlugene' bird is shected and given to the poor. What are you going to do with a 'geshlugener' hamster? Give it to a satanic bird? It would be cruel to feed devitalized, cooked/canned fish to a bird designed to eat freshly killed, raw mammals, birds and reptiles, including their internal organs, skins and bones; these provide important nutrients and serve the function of dietary fiber (Not too long ago, it was believed by physicians that dietary fiber was useless or even harmful!) 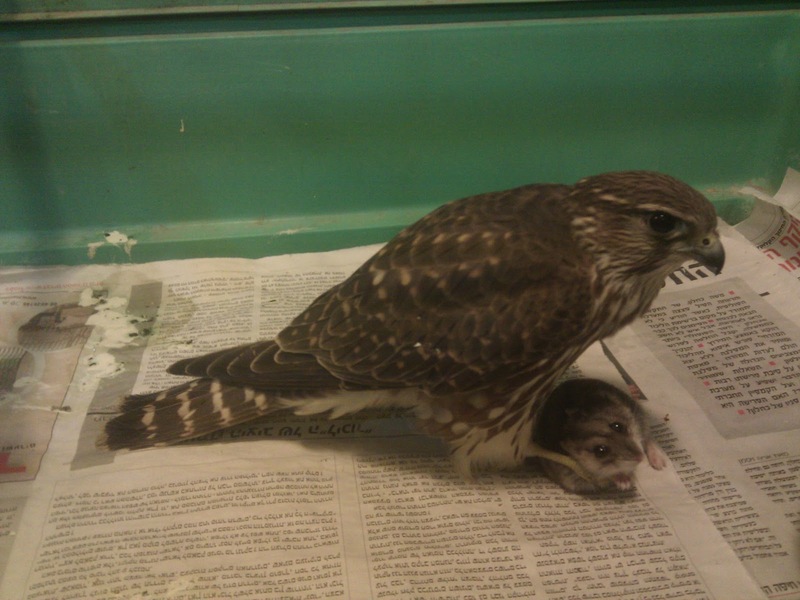 since, except in their prey's intestinal contents, raptors don't eat vegetation or fruit. I don't think the bird looks at all evil. Honestly I think it is rather pretty. Yes it eats animals, but so do we and a lot of other things. If it didn't it would starve to death. also nice shofars in the picture, with their ungulate bearers. why two different animals on third shelf from top? Apparently the kestrel with the broken wing is given life at the expense of healthy hamsters. May I ask (in all sincerity) what rationale is being applied for this? 3) Because it's a fun and challenging project. If we were doing an experiment to see if hamsters could survive on kestrel meat things could just as easily be reversed. That's how God made kestrels. How is the bird doing? That's a female Merlin, not a Kestrel.